Lot 82 Brass LNER 9x5 Oval Steam Locomotive Worksplate. 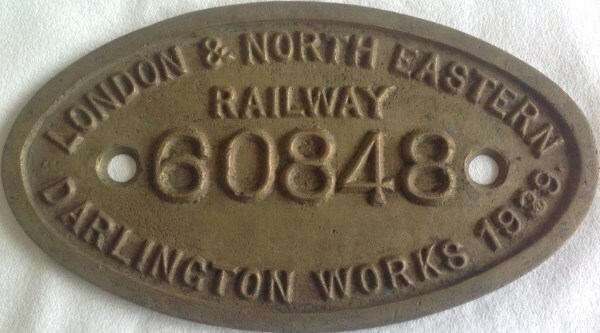 "London & North Eastern Railway - No 60848 - 1939". Built Darlington Works as No 4819 in 1939. As carried by a V2 Class 2-6-2. - BR No 60848. Allocation included 64A. 64B and 52A. Wdn from York in 7/62 - Cut up At Darlington 8/62. Ex Loco condition.